It’s 2:30am on Tuesday morning and Lucretia is doing laundry while humming the tune of The Band Played On, a popular song of 1895. The last line is one she’d repeat often during our time together; a time of overwhelming new information and long-lost connections. Just one week ago, Lucretia learned she has an 89-year-old biological brother who lives in Seattle, Washington. Tomorrow, the siblings will meet for the first time. Indeed, her mind was loaded. In 1923, Lucretia was left at the Medina Baby Home by her biological parents. 15 months later, she was adopted. Lucretia learned she was adopted from a peer in third grade although her adoptive mother denied this truth – even on her deathbed. Lucretia stayed in touch with Medina (now Amara) over the years as she always wondered about her beginnings. Why was she dropped off at an orphanage? Who were her birth parents? Did she have any siblings? Having grown up in a closed adoption myself, I understood Lucretia’s anguish in a visceral way. In my role as the Director of Post-Adoption Services at Amara, I decided to enlist further support from Della, a former journalist turned amateur genealogist whose keen investigative skills and historical insight helped me understand important aspects of my biological family story. The most nagging question Lucretia desired to have answered was about her birth mother’s origins: “Some of my paperwork states that she was born in Texas and other documents say Mexico. Can you help me figure out which is true?” I thought Della was just the person to help complete the puzzle of Lucretia’s life story. With Della’s help, Lucretia completed a DNA test through ancestry.com. Three months after Lucretia submitted her DNA, I received a phone call from Della. She had located a previously unknown biological brother of Lucretia’s through finding a match on a census! Charles, an 89-year-old man living out his retirement in Seattle, had answered Della’s phone call and immediately recounted stories from his childhood about his sister named Lucretia, whom he’d never been able to find but always knew existed. Through all of the complex emotions Charles felt, he desired to visit his big sister – and soon. As one may suspect, there is a certain urgency to such things when you’re almost 90 years old and in less-than peak health. Charles bought a ticket to San Francisco for the following week. 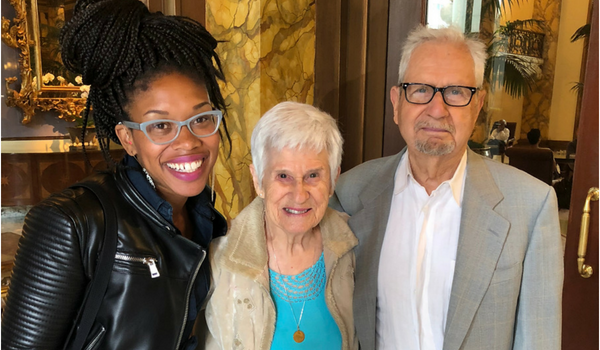 Just a week later, I found myself sharing a meal with Lucretia at the Heritage, a retirement community in the Marina district of San Francisco, to support her in meeting her biological brother for the first time. Often, supporting such meetings means wading through complex emotions of grief, guilt, and anxiety – yet Lucretia was remarkably calm, waxing poetic about topics such as how modern technological advances have served to isolate people, measuring this statement against her childhood memories of neighbors helping each other on the farm during the Great Depression. She shared about being pastored by civil rights leader Howard Thurman (a powerful influence on Dr. Martin Luther King Jr) when she attended the first racially integrated, intercultural church in the United States. The more Lucretia spoke, the more my appreciation and amazement grew. Throughout our meal, we were frequently interrupted by her friends, residents of the facility, who came up to ask Lucretia, “Have you met your brother yet! ?” and “When will he be here! ?” She excitedly answered “He’ll be here tomorrow! Oh, and I’d like to introduce you to my new friend, Angela – she was adopted too!” 63 years her junior, I beamed inside at the honor to be considered a friend to someone who had experienced so much in nearly a century of life. After spending the better part of the day at the Heritage, I returned to my hotel room, changed into jogging clothes, and ran up some of San Francisco’s infamous hills. As I took in the sweeping views of the Marin Headlands, I was overwhelmed by the magnanimity of this woman that I’d come to love. Wednesday was Charles and Lucretia’s first meeting. It was a private and sacred affair as they desired to share details about their family without anyone else present. It is my understanding that some of Lucretia’s pressing questions were answered at that time. On Thursday, we dined together, which primarily was a silent time of contentedness and delight. Lucretia and Charles stared at each other with gratitude in their eyes, which reminded me of the moment I first looked into my biological sisters’ eyes. I was 26 years old, she was 29 and yet I momentarily saw us as children playing in the yard together in a Cosby show-esque home – I was fantasizing about what could’ve been. I wonder what was going through Lucretia’s mind. After our lunch, my mind was even more full. I strapped on my running shoes and hit the hills again. With Alcatraz in view and the smells of the Fisherman’s Wharf in the air, I felt a certain emotional relief as the barking of sea lions interrupted the soundtrack of my racing thoughts. I couldn’t help but wonder why neither Lucretia nor Charles expressed any anger that they weren’t connected sooner. I wondered if my presence had eased the emotional brunt of this moment enough for their frail bodies to withstand it all. I hoped with all my might that this reunion would remain life-giving and fulfilling for both Charles and Lucretia. In my past experience, a difficult to explain sadness can follow such extreme moments of joy. Mostly, I reflected on the enormity of this experience. Lucretia lived through the Great Depression in the 1930s, served as an army nurse for World War II in the 1940s, was a reproductive rights activist during Roe v. Wade in the 1970s, was incarcerated for civil disobedience while protesting nuclear disarmament in the 1980s and lives a remarkably independent life at 95 years old. Yet, she was clear that finding and meeting her biological brother for the first time was unquestionably the pinnacle experience of her life. I was floored by this reminder of the life-long importance of working towards reconnecting, repairing, and restoring connections with family. With sore calves and a full heart, I have found this experience almost too great to bear. What an honor.